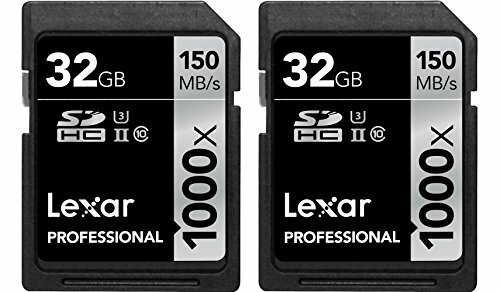 Capture Full HD, 3D, and 4K content with the 2-pack of 32GB Professional 1000x UHS-II SDHC Memory Cards from Lexar. Each of the included SDHC memory cards meets the UHS Speed Class 3 specification with a minimum data write speed of 30 MB/s and maximum data read speed of up to 150 MB/s. While this card is designed to meet the needs of those requiring enhanced data transfer rates, it remains backwards compatible with devices requiring UHS-I, Class 10 memory cards. To safeguard against possible data loss, this card includes downloadable Image Rescue software designed to recover most photo and video files. FORM FACTOR: SDHC UHS-II Memory Card. STORAGE CAPACITY: 32 GB. SPEED RATING: UHS Class 3 / Class10 - 1000x. If you have any questions about this product by Lexar, contact us by completing and submitting the form below. If you are looking for a specif part number, please include it with your message.